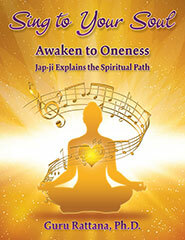 Sing to Your Soul by Guru Rattana, Ph.D., provides a comprehensive introduction to Jap-Ji, a spiritual text that reaches out to us all to awaken to our oneness, regardless of spiritual path, class or creed. Meaning sing to your soul, it was first recited after a spiritual awakening by Guru Nanak (1469-1539), initiator of the Sikh path. Originally written in Gurumukhi (language of the gurus), its recitation offers a formula for achieving higher consciousness and awakens the mind to an experience of the Infinite. Simply listening to its universal message every day is beneficial. Sing to Your Soul poetically explains the essence of Guru Nanak’s discourse, and offers a meaningful understanding of spiritual principles that enlightened ones have tried to convey for millennia. Addressing major questions of seekers everywhere, it clarifies concepts still relevant to our life and times, and fits them all together to show the exquisite beauty of Jap-ji's elevated totality. Guru Rattana's deep understanding assists seekers of all paths to effortlessly follow the basic steps of their spiritual journey, and to feel the true meaning of Guru Nanak's message, planting the seed of love in our hearts, bringing light and clarity to our spiritual path, and setting out guidelines for our yogic practice.